Summer is the most popular time to visit Montreal. 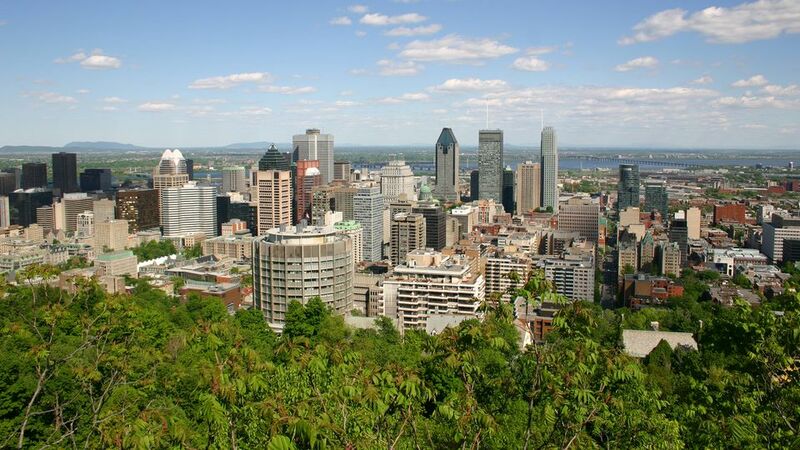 Infused with French heritage, including a large French-speaking population, Montreal draws huge numbers of Canadians, Americans, and international visitors for its well-preserved Old Town, sophisticated cultural sites, and culinary scene. In August, the city comes alive with events like the Montreal World Film Festival and the Osheaga music festival. High temperatures make it nice to walk around and sightsee, but the extreme humidity may be a turnoff to some. It can also get chilly at night thanks to the city's location along the St. Lawrence River. Summer means more crowds and higher travel prices, fuller than usual hotels and longer lineups at Montreal's top tourist attractions. Montreal has hot and humid weather in August, with the average high hitting 75°F and the average low dropping to 54°F. On extreme days, temperatures can reach in the 90s. If you plan on walking around a lot outside, expect to be very sweaty. That said, air conditioning on trains, in hotels, shops, and restaurants can be refreshing. Visitors should also expect rain for about nine days in August. Because of the humidity and heat during the day, most of the clothes you'll need should be airy, and light-weight, including shorts, T-shirts, and sundresses for women. Although sandals are perfectly acceptable, you may want closed-toe shoes for walking around Montreal's cobblestoned Old Town. Also, don't forget the sunscreen, hats, and sunglasses for bright, sunny days. In the evening, bring a light jacket, shawl, or sweater as it can get a bit chilly. If there's rain in the forecast, pack an umbrella, and for those heading out of the city into the more rural areas, you may want to have bug spray. In the summer, Montreal comes alive with festivals and events that celebrate music, art, culture, and more. Mont-Royal: This Frederick Law Olmsted-designed park has sweeping skyline views. Go on a Sunday to enjoy the weekly drum fest known as Tam Tams. Osheaga: A music and arts festival that has featured some of the world's most famous musical acts, including Coldplay, The Killers, Mumford and Sons, Iggy & The Stooges, Sonic Youth, The Roots, Rufus Wainwright, Arcade Fire, Eminem, Beck, and more. Rogers Cup Tennis: The biggest names in women's and men's tennis compete for the Rogers Cup, which alternates between Montreal and Toronto every other year. The Montreal World Film Festival: This is one of Canada's oldest international film festivals, founded in 1977.
International Balloon Festival of Saint-Jean-sur-Richelieu: This festival, which happens just 20 minutes outside Montreal, is the biggest of its kind in Canada. It brings together a rainbow of variously shaped hot air balloons from several countries. Montreal's Italian Week: A celebration of Italian music and culture. Montreal Pride: (Fierté Montreal) a weeklong celebration with art, music, entertainment and Pride Parade. Before you go to Montreal in August, there are some things you should know in order to plan a seamless trip. Montreal temperatures can reach the 90s, and it can get extremely humid. Be sure to stay hydrated and carry a water bottle with you at all times. This is especially important for older travelers and children. Unlike most other Canadian provinces, Quebec does not have a long weekend at the beginning of August. Summer is high season, meaning everything is more expensive and crowded. Be sure to book transportation, including flights, trains, rental cars, and hotel transfers, as well as restaurant reservations, city tours, and hotels ahead of time. What Is Montreal Like in September?